Description: On 7 February, Brig. Gen. Ambrose E. Burnside landed 7,500 men on the southwestern side of Roanoke Island in an amphibious operation launched from Fort Monroe. The next morning, supported by gunboats, the Federals assaulted the Confederate forts (see Burnside's North Carolina Expedition) on the narrow waist of the island, driving back and out-maneuvering Brig. Gen. Henry Wise’s outnumbered command. After losing less than 100 men, the Confederate commander on the field, Col. H. M. Shaw, surrendered about 2,500 soldiers and 32 guns. Burnside had secured an important outpost on the Atlantic Coast, tightening the blockade. Roanoke Island also was a strategic objective in Gen. Winfield Scott's Anaconda Plan. By late spring 1862, Union soldiers occupied Hatteras Inlet and controlled the towns of Plymouth, Washington and New Bern. The loss of most of the North Carolina coast and coastal waterways was a blow both to Confederate morale and the young nation's ability to supply its armies in the field. But aside from a few raids from those bases, the Union forces didn't advance until Sherman entered North Carolina in March-April 1865, in what is commonly referred to as Sherman's March. The following is a history of the battle with maps. 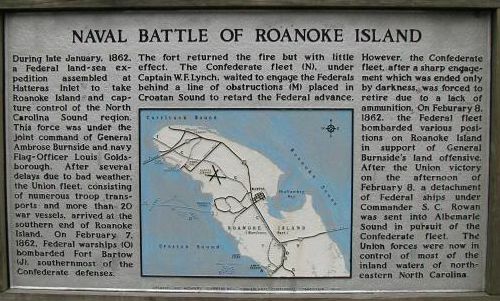 History: The opening phase of what came to be known as the Burnside Expedition, the Battle of Roanoke Island was an amphibious operation of the American Civil War, fought on 7–8 February 1862 in the North Carolina Sounds a short distance south of the Virginia border. The attacking force consisted of a flotilla of gunboats of the United States Navy drawn from the North Atlantic Blockading Squadron, commanded by Flag Officer Louis M. Goldsborough, a separate group of gunboats under United States Army control, and an Army division led by Brigadier General Ambrose E. Burnside. The defenders were a group of gunboats from the Confederate States Navy, termed the Mosquito Fleet, under Captain William F. Lynch, and about 2000 Confederate soldiers commanded locally by Brigadier General Henry A. Wise. The defense was augmented by four forts facing on the water approaches to the island, and two outlying batteries. At the time of the battle, Wise was hospitalized, so leadership fell to his second in command, Colonel H. M. Shaw. The first day of the battle was spent mostly in a gun duel between the Federal gunboats and the forts on shore, with occasional contributions from the Mosquito Fleet. Rather late in the day, Burnside's soldiers came ashore unopposed; they were accompanied by six howitzers manned by sailors. As it was too late to fight, the invaders went into camp for the night. On the second day, 8 February, the Union soldiers advanced, but were stopped by an artillery battery and accompanying infantry in the center of the island. Although the Rebels thought that their line was safely anchored in impenetrable swamps, they were flanked on both sides and their soldiers were driven back to refuge in the forts. The forts were taken in reverse, however. With no way for his men to escape, Col. Shaw surrendered in order to avoid pointless bloodshed. (About) Map shows both Union and Confederate navies maneuvering for respective positions for the imminent Battle of Roanoke Island. Strategic Significance: Northeastern North Carolina is dominated by its sounds, large but shallow bodies of brackish-to-salt water that lie between the mainland and the Outer Banks. Although they are actually all one body, intimately connected and having a common level, they are conceptually divided into several distinct regions. The largest of these is Pamlico Sound, immediately behind Hatteras Island; to its north is the second largest, Albemarle Sound, which extends almost to the southern border of Virginia. 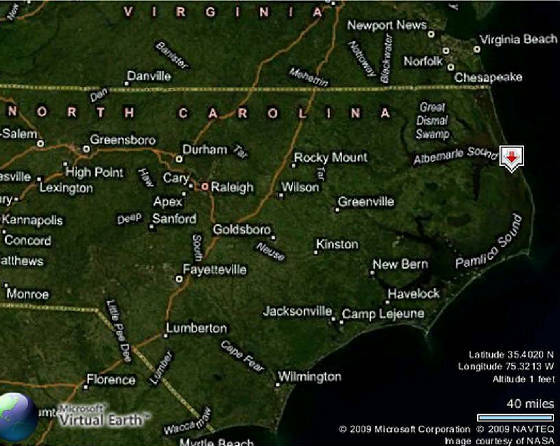 The linkage between these two, already somewhat narrow, is further constricted by Roanoke Island. The portion of the waterway between Roanoke Island and the mainland is known as Croatan Sound. Both the island and the sound are about ten miles (16 km) long. The sound at its widest point is a little more than 4 miles (6.5 km) across, the island about half that. On the eastern side of the island is Roanoke Sound, much narrower, shallower, and less important. Several North Carolina cities were sited on the sounds, among them being New Bern (usually written New Berne in the mid-nineteenth century), Beaufort, Edenton, and Elizabeth City. Others, not lying directly on the sounds, were accessible to the rivers that emptied into them. As much as a third of the state is in their watershed. Through most of the first year of the Civil War, the sounds remained in possession of Confederate forces, so that coastwise water-borne commerce of the eastern part of the state was unimpeded. Furthermore, the sounds were linked to Norfolk, Virginia by the Albemarle and Chesapeake Canal and the Dismal Swamp Canal. This was particularly significant, as it meant that the blockade of Norfolk could not be complete so long as cargos could reach the city through its back door. 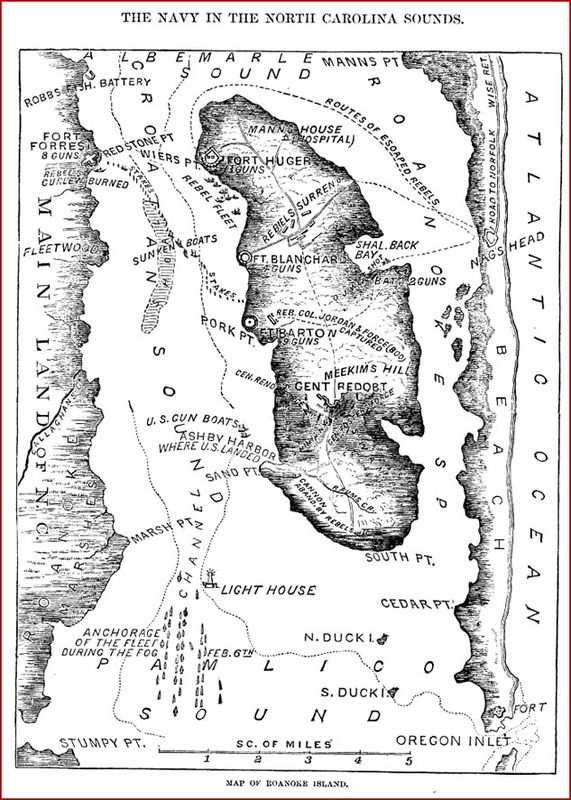 Communications were not affected appreciably when Federal forces captured the forts on the Outer Banks at Hatteras Inlet in August 1861, as the Union Navy could not bring its deep-water vessels into the sounds through the shallow inlets. Roanoke Island was obviously the key to control of the Sounds. If it were controlled by the Union forces, they would have a base that could be attacked only by an amphibious operation that the Rebels were incapable of. If Union naval superiority could be established there, all points on the mainland shores would be equally vulnerable to assault. The Confederate defenders would be forced into an impossible situation: they would either have to give up some positions without a fight, or they would have to spread their assets too thin to be of any use. 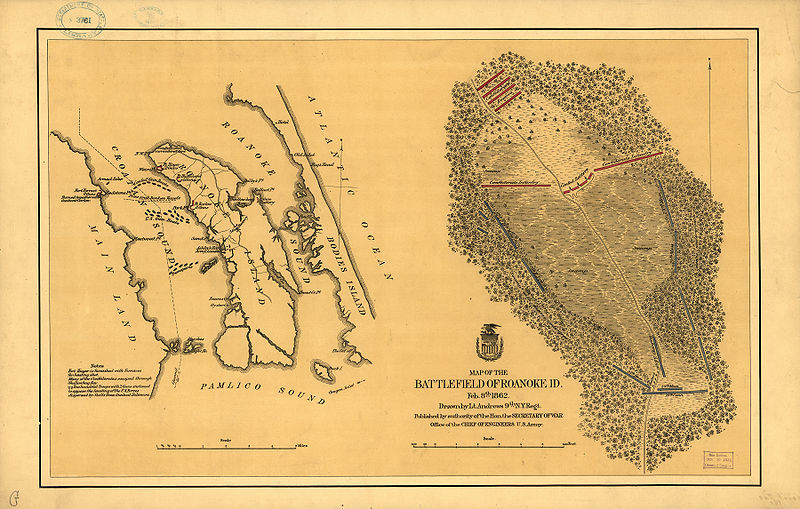 (About) Map reflects Burnside's initial route and thrust to Roanoke Island, which was the first of a series of battles in the Burnside Expedition. Courtesy Clark's North Carolina Regiments. The defense of Roanoke Island started in an accidental manner. 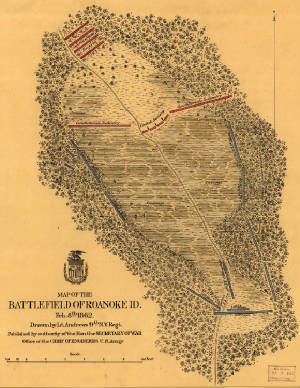 When the Federal fleet appeared off Hatteras Inlet on 27 August 1861, the 3rd Georgia Infantry Regiment was hastily sent from Norfolk to help hold the forts there, but the forts fell before they arrived, so they were diverted to Roanoke Island. They remained there for the next three months, making somewhat desultory efforts to expel the Yankees from Hatteras Island. (Right) Union and Confederate warships in lines of battle at Roanoke Island. Little was done to secure the position until early October, when Brigadier General Daniel H. Hill was assigned to command the coastal defenses of North Carolina in the vicinity of the sounds. Hill set his soldiers to putting up earthworks across the center of the island, but he was called away to service in Virginia before they were completed. Shortly after his departure, his district was split in two; the southern part was assigned to Brigadier General Lawrence O'B. Branch, while the northern part was put in control of Brigadier General Henry A. Wise. Wise's command included Albemarle Sound and Roanoke Island, but not Pamlico Sound and its cities. 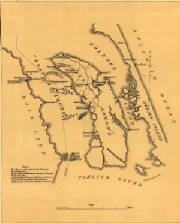 It is also significant that Branch reported to Brigadier General Richard C. Gatlin, who commanded the Department of North Carolina, while Wise was under Major General Benjamin Huger, who was in charge of the defenses of Norfolk. Wise had been commander of the so-called Wise Legion, but his troops did not accompany him. The Legion was broken up, although he was able to retain two of his old regiments, the 46th and 59th Virginia. He also had three regiments of North Carolina troops, the 2nd, 8th, and 17th North Carolina, plus three companies of the 17th North Carolina. The men from North Carolina were ill-equipped and ill-clad, often armed with nothing more than their own shotguns. All told, the number came to about 1400 infantrymen, but the number available for duty was smaller than that because the living conditions put as many as one-fourth of the command on the sick list. Wise begged Richmond to send him some guns, as had Hill before him, but the numbers were inadequate. They were distributed into several nominal forts: facing Croatan Sound were twelve guns in Fort Huger, at Weir's Point, the northwestern corner of the island; four guns in Fort Blanchard, about a mile (1.6 km) to the southeast; and nine guns in Fort Bartow, at the romantically-named Pork Point, about a quarter of the way down the island. Across the sound, at Redstone Point opposite Fort Huger, two old canal barges had been pushed up onto the mud, protected by sandbags and cotton bales, armed with seven guns, and titled FortForrest. These were all the guns that would bear on the sound; the entire half of the island nearest Pamlico Sound, the direction from which the attack would come, was unprotected. Five other guns did not face Croatan Sound: a battery of two guns on the eastern side of the island protected against possible assault across Roanoke Sound, and three others occupied an earthwork near the geometric center of the island. "Captain Lynch was energetic, zealous, and active, but he gave too much consequence entirely to his fleet of gunboats, which hindered transportation of piles, lumber, forage, supplies of all kinds, and of troops, by taking away the steam-tugs and converting them into perfectly imbecile gunboats." Despite Wise's disapproval, the Mosquito Fleet was part of the defense, and the Yankees would have to deal with it. 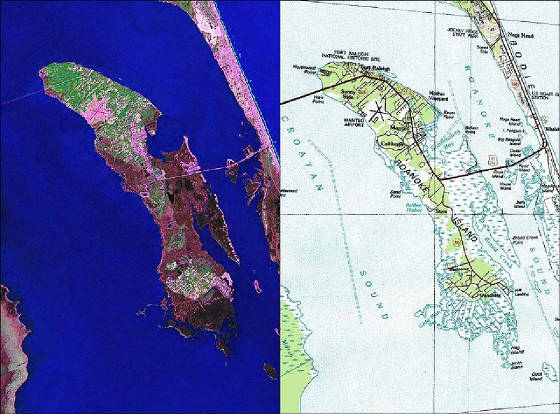 Satellite Photograph of Roanoke Island, N.C.
A short time after Hatteras Island was captured for the Union, Brigadier General Ambrose E. Burnside began to promote the idea of a Coast Division, to be composed of fishermen, dockworkers, and other watermen from the northeastern states, and used to attack coastal areas. He reasoned that such men were already familiar with ships, and therefore would be easy to train for amphibious operations. Burnside was a close friend of General-in-Chief George B. McClellan, so he got a respectful hearing. Although Burnside had initially intended to operate in Chesapeake Bay, in the hands of McClellan and the War Department his ideas were soon transformed into a planned assault on the North Carolina interior coast, beginning with Roanoke Island. An unspoken reason for the change of target was the mistaken belief that pro-Union sentiment was being suppressed in North Carolina, and an invasion would allow the Tar Heels to express their true loyalties. When it was fleshed out, the invasion of North Carolina came to be known as the Burnside Expedition. As recruiting progressed, Burnside organized the Coast Division into three brigades, led by three of Burnside's friends from his Military Academy days. Brig. Gen. John G. Foster led the First Brigade, Brig. Gen. Jesse L. Reno the Second, and Brig. Gen. John G. Parke the Third. In early January, nearly 13,000 men were ready for duty. Although the Navy would provide most of the gunnery that would be needed to suppress the Rebel batteries, Burnside decided to have some gunboats under Army control. This immediately led to some interference between the two services. The Navy had no vessels sturdy enough to go to sea and at the same time draw little enough water to be able to pass through the shallow inlet, thought to be about 8 feet (2.5 m). They therefore had to buy suitable merchant ships for conversion, at the very time that Burnside and his agents were also dickering for their ships. Because the sailors were more experienced, they were able to get most of the more suitable ships. The Army was left with a mixed bag of rickety ships that were barely seaworthy. By the time the expedition got under way, the Navy had 20 gunboats, and the Coast Division had 9. The armada was supplemented by several canal boats converted into floating batteries, mounting boat howitzers and protected by sandbags and bales of hay. All told, the expedition carried 108 pieces of ordnance. While Burnside's agents were purchasing the gunboats they were also buying or leasing other vessels to be used as transports. The soldiers and transports for the expedition assembled at Annapolis. Embarkation began on 5 January 1862, and on 9 January they began to get under way, with orders to rendezvous at Fort Monroe, near the entrance to Chesapeake Bay. There they met the naval contingent, and on 11 January they set sail. Until this time, only Burnside and his immediate staff knew their ultimate destination. Once at sea, the captain of each ship opened his sealed orders and learned that his ship should proceed to the vicinity of Cape Hatteras. For many of the Federal soldiers, the voyage to Hatteras Inlet was the worst part of the battle. Earning its reputation, the weather in the vicinity of Cape Hatteras turned foul, causing many of them to become seasick. In an act of bravado, Burnside left his comfortable quarters aboard the transport George Peabody and with his staff went aboard Army gunboat Picket. He chose this vessel because he considered her to be the least seaworthy ship in his command, and by showing his troops that he was willing to share their misery, he earned their devotion. When the storm struck, he began to doubt the wisdom of his move, but Picket survived and got him safely to his destination. Three vessels in the armada were not so lucky: City of New York, laden with ordnance and supplies; Pocahontas, carrying horses; and Army gunboat Zouave were all lost, although all persons aboard were rescued. The only personnel losses were two officers of the Ninth New Jersey, who were drowned when their surfboat overturned following a visit to the flagship. The entry into Pamlico Sound through Hatteras Inlet was time consuming. The swash, thought to be eight feet (2.5m) deep, was found the hard way to be only six feet (1.9m). Some of the Army ships drew too much to get across, and had to be kedged in after being lightened. Others were too deep even to be kedged in; the men or materials they carried had to be brought ashore on Hatteras Island, and the ships sent back. Bark John Trucks never made it at all; she could not get close enough to Hatteras Island even for the men aboard to be taken off. She returned to Annapolis with an entire regiment, the Fifty-third New York, who thereby missed the battle. Not until 4 February was the fleet as ready as it ever would be and assembled in Pamlico Sound. While the Northern fleet was struggling over the bar, the Rebels were strangely inert. No reinforcements were sent to the island, or, for that matter, any of the other possible targets in the region. The number of infantrymen on the island remained at about 1400, with 800 in reserve at Nag's Head. The major change was negative: on 1 February, General Wise came down with what he called "pleurisy, with high fever and spitting of blood, threatening pneumonia." He was confined to bed at Nag's Head, and remained hospitalized until 8 February, after the battle was over. Although he continued to issue orders, effective command on Roanoke Island fell to Colonel H. M. Shaw of the Eighth North Carolina Infantry. The fleet got under way early the next morning (5 February), and by nightfall were near the southern end of Roanoke Island, where they anchored. Rain and strong winds prevented movements the next day. The major activity was Goldsborough's shift of his flag from USS Philadelphia to Southfield. On 7 February the weather moderated, and the Navy gunboats got into position. They first fired a few shells inland at Ashby Harbor, the intended landing place, and determined that the defenders had no batteries there. They then moved up Croatan Sound, where they were divided; some were ordered to fire on the fort at Pork Point (Fort Bartow), while others were to concentrate their fire on the seven vessels of the Mosquito Fleet. At about noon, the bombardment began. The weakness of the Confederate position became manifest at this time. Only four of the guns at Fort Bartow would bear on the Union gunboats. Forts Huger and Blanchard could not contribute at all. Fort Forrest, on the other side of the sound, was rendered completely useless when gunboat CSS Curlew, holed at the waterline, ran ashore directly in front in her effort to avoid sinking, and in so doing masked the guns of the fort. Losses were light on both sides despite the intensity of the fight. Several of the Federal ships were hit, but none suffered severe damage. This was true for the Rebels also, aside from Curlew, but the remaining Mosquito Fleet had to retire simply because they ran out of ammunition. The Army transports, accompanied by its gunboats, had in the meantime arrived at Ashby Harbor, near the midpoint of the island. At 1500, Burnside ordered the landings to begin, and at 1600 the troops were reaching shore. A 200-man strong Rebel force commanded by Col. John V. Jordan (31st North Carolina), in position to oppose the landing, was discovered and fired on by the gunboats; the defenders fled without any attempt to return fire. There was no further opposition. Almost all of the 10000 men present were ashore by midnight. With the infantry went six launches with boat howitzers, commanded by a young midshipman, Benjamin H. Porter. The Yankees pushed inland a short distance and then went into camp for the night. The Federal soldiers moved out promptly on the morning of 8 February, advancing north on the only road on the island. Leading was the First Brigade's 25thMassachusetts, with Midshipman Porter's howitzers immediately following. They were soon halted, when they struck the Confederate redoubt and some 400 infantry blocking their path. Another thousand Rebels were in reserve, about 250 yards (230 m) to the rear; the front was so constricted that Colonel Shaw could deploy only a quarter of his men. The defensive line ended in what were deemed impenetrable swamps on both sides, so Shaw did not protect his flanks. The leading elements of the First Brigade spread out to match their opponents' configuration, and for two hours the combatants fired at each other through blinding clouds of smoke. The 10th Connecticut relieved the exhausted, but not badly bloodied, 25th Massachusetts, but they too could not advance. No progress was made until the Second Brigade arrived, and its commander, Brig. Gen. Reno, ordered them to try to penetrate the impenetrable swamp on the Union left. Brig. Gen. Foster then ordered two of his reserve regiments to do the same on the right. About this time, Brig. Gen. Parke came up with the Third Brigade, and it was immediately sent to assist. Although they were not coordinated, the two flanking movements emerged from the swamp at nearly the same time. Reno ordered his 21st Massachusetts, 51st New York, and 9th New Jersey to attack. As they were firing on the Confederates, the 23rd Massachusetts, from the First Brigade, appeared on the other end of the line. The defensive line began to crack; noting this, Foster ordered his remaining forces to attack. Under assault from three sides, the Rebels broke and fled. As no fall-back defenses had been set up, and he was bereft of artillery, Col. Shaw surrendered to Foster. Included in the capitulation were not only the 1400 infantry that he commanded directly, but also the guns in the forts. Two additional battalions (2nd North Carolina and 46th Virginia) had been sent as reinforcements. They arrived too late to take part in the battle, but not too late to be take part in the surrender. Altogether, some 2500 men became prisoners of war. Aside from the men who went into captivity, casualties were rather light by Civil War standards. The Federal forces lost 37 killed, 214 wounded, and 13 missing. The Confederates lost 23 killed, 58 wounded, and 62 missing. 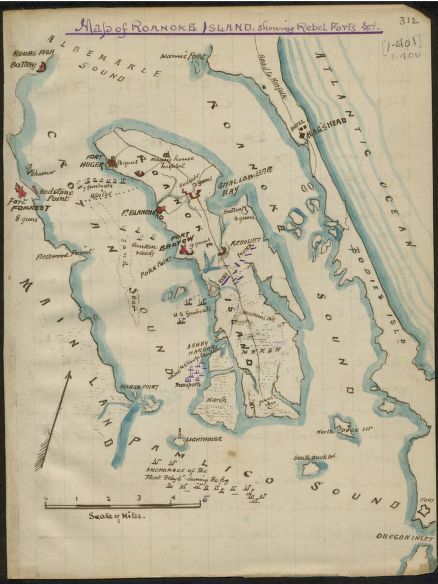 (About) Map of Roanoke Island, showing forts and fleet dispositions, February 7, 1862, on the left, and on the right, the battlefield where opposing armies met on February 8. Prepared by Lt. Andrews, 9th N.Y. Regiment. Library of Congress. 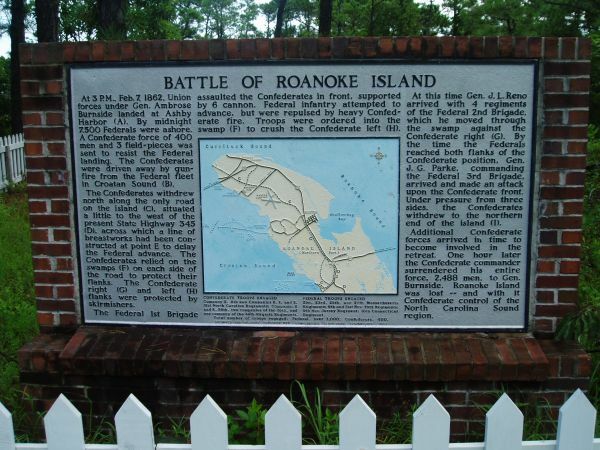 Roanoke Island remained in Federal control for the rest of the Civil War. Immediately after the battle, the Federal gunboats passed the now-silent Confederate forts into Albemarle Sound, and destroyed what was left of the Mosquito Fleet at the Battle of Elizabeth City. Burnside used the island as staging ground for later assaults on New Bern and Fort Macon, resulting in their capture. Several minor expeditions took other towns on the sounds. The Burnside Expedition ended only in July, when its leader was called to Virginia to take part in the Richmond campaign. 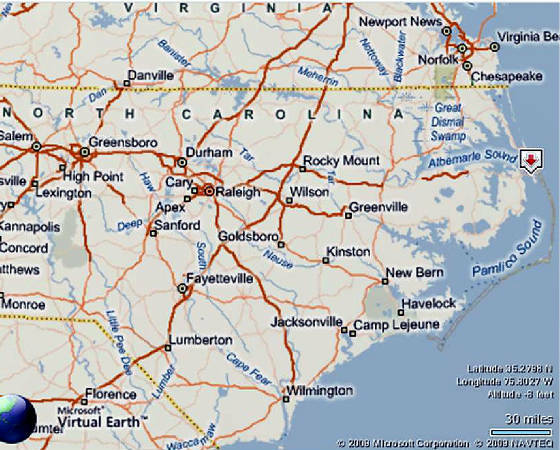 After Burnside withdrew, North Carolina ceased to be an active center of the war. With only one or two exceptions, nothing notable took place until the last days of the war, when the Battle of Fort Fisher closed Wilmington, the last port in the Confederacy. The pictures can almost tell the story, but the rich historical detail in the text is absolutely fascinating. This book features drawings by James Wells Champney, who was also stationed at Fort Macon in the Outer Banks with the Union forces. In addition, journal entries and personal correspondence of soldiers such as Charles F. Johnson and Capt. William Chase (of the 4th Rhode Island) and the development of freedom's colony allow the reader a truly personal look into the soldiers' lives during these trying times. References: Burnside, Ambrose E., "The Burnside Expedition," Battles and leaders of the Civil War, Johnson, Robert Underwood, and Clarence Clough Buell, eds. New York:Century, 1887–1888; reprint, Castle, n.d.; Browning, Robert M. Jr., From Cape Charles to Cape Fear: the North Atlantic Blockading Squadron during the Civil War. Univ. of Alabama, 1993; Campbell, R. Thomas, Storm over Carolina: the Confederate Navy's struggle for eastern North Carolina. Cumberland House, 2005; Miller, James M., The Rebel shore: the story of Union sea power in the Civil War. Little, Brown and Co., 1957; Trotter, William R., Ironclads and Columbiads: the Coast. Joseph F. Blair, 1989; US Navy Department, Official records of the Union and Confederate Navies in the War of the Rebellion. Series I: 27 volumes. Series II: 3 volumes. Washington: Government Printing Office, 1894–1922; US War Department, A compilation of the official records of the Union and Confederate Armies. Series I: 53 volumes. Series II: 8 volumes. Series III: 5 volumes. Series IV: 4 volumes. Washington: Government Printing Office, 1886–1901; Microsoft MapPoint; Microsoft Virtual Earth Map (2D): Microsoft Virtual Earth Map (3D); NASA Maps; Library of Congress.